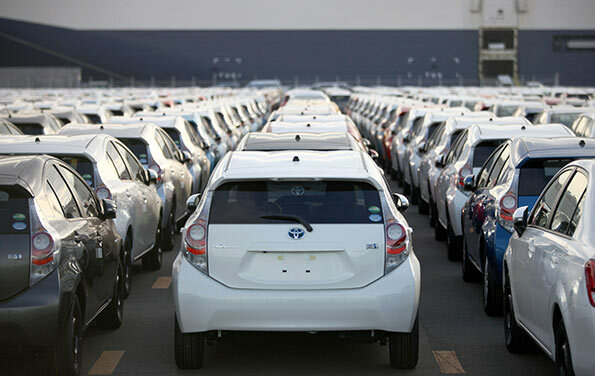 “Japanese vehicle imports to the country will be suspended for six months due to the present currency fluctuations, Vehicle Importers’ Association of Sri Lanka (VIASL) president Indika Sampath Merenchige said. “Sri Lanka is the number one importer of Japanese vehicles, in terms of value, after Malaysia and will suspend vehicle imports considering the difficulties faced by vehicle importers due to the fluctuation of the exchange rates. They have decided to restrict importing vehicles, Merenchige said at a media conference held at National Chamber of Commerce auditoriuum yesterday. Two premier used vehicle importer associations in Sri Lanka, the Vehicle Importers Association of Sri Lanka and Vehicle Importers Association of Lanka summoning the joint press conference said they contemplate restricting vehicle imports for three to six months to the country. The cost of used and brand new vehicles that are imported from Japan had gone up drastically due to the depreciation of the SL rupee against the dollar and appreciiation of the Japanese yen against the dollar and other factors like the government restriction on imports, Merenchige said. “But if anyone still wants to import vehicles they may do so, although they will be called upon to bear the increased cost, which could be an increase of Rs.300,000 to Rs.400,000, due to the currency fluctuations, he said. “During the past 4 to 5 months, the Japanese yen unit value increased drastically. Because of this, to release even a small hybrid vehicle from the harbour an additional sum of Rs 350,000 to 500,000 has to be paid, Merenchige explained. “Unable to bear this burden, vehicle importers are facing bankruptcy. Because of this to safeguard the government’s foreign reserves and vehicle importers alike, until exchange rates become normal, except in special instances, we have decided to restrict imports, Merenchige said. “Following a meeting among local vehicle importers today, a decision was taken to stop the import of vehicles for three to six months until the foreign exchange rates stabilize, he said. “The vehicles that had already been imported would be sold at the current market value so as not to cause any inconvenience to the government, he added. “However. the increased fifteen percent VAT policy would not affect imported vehicles, he said. Chairman of the Vehicle Importers’ Association of Lanka Mahinda Sarathchandra explained that the decision to put a temporary halt to Japanese vehicle imports was taken due to the foreign currency rate increase, mainly in relation to the Japanese Yen, US dollar, sterling pound and the Euro. “About 15,300 motor cars were imported into the country during the past 4 months which is a slight drop in comparison to 2015 which saw 150,628 cars being imported, he said. The two premier used vehicle importer associations which are registered in Sri Lanka, Vehicle Importers Association of Sri Lanka and Vehicle Importers Association of Lanka comprise over 500 vehicle importers.